Researchers from Shanghai Jiao Tong University and the University of Nevada, Las Vegas have calculated that compressed lonsdaleite (also called a hexagonal diamond) is 58% harder than a diamond. Traditionally, lonsdaleite has been rated between 7 and 8 on the Mohs scale of hardness (the diamond is a 10), but compressing the material causes a transformation of its structure into a much harder material. Lonsdaleite was first discovered in 1967 and is formed when meteorites containing graphite strike the Earth. 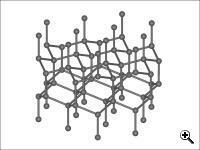 It can also be synthesized in a laboratory by compressing and heating graphite. Like diamond, it is a form of carbon but instead of a cubic crystal structure, lonsdaleite has a hexagonal structure (hence its alternate name of hexagonal diamond). When extreme pressures are applied to lonsdaleite and another material called wurtzite boron nitride using a two stage shear deformation, they flip their atomic bonds resulting in significantly stronger materials than the unpressurized materials. Both are stronger than diamond in this pressurized state; diamond is rated at 97 Gigapascals while wurtzite boron nitride is rated at 114 Gigapascals and lonsdaleite at 152 Gigapascals under the same conditions. This discovery may eventually lead to new superstrong materials. 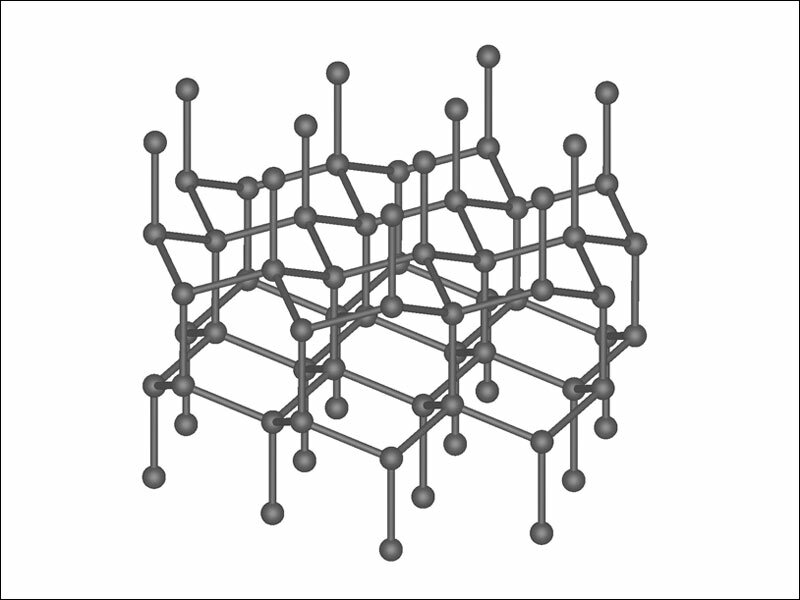 However, both wurtzite boron nitride and lonsdaleite are difficult to synthesize in large quantities, so practical applications using these stronger materials are not yet feasible (methods for synthesizing nanocomposites containing lonsdaleite and wurtzite boron nitride are under development to assist in further research). In addition, many practical uses of hard materials require other qualities such as thermal stability at high temperatures. Conductivity, superconductivity, and magnetism are also desirable qualities for many applications of superstrong materials. The pressurized wurtzite boron nitride and lonsdaleite may or may not meet these other requirements. TFOT has previously reported on other innovative materials including new metallic glass alloys capable of enduring significant deformations without breaking, new memory cables capable of holding their shape regardless of how they are bent or extended, self healing rubber capable of healing itself even after being cut into two pieces, and new metal plastic composite conductors that may significantly reduce the cost and size of printed circuit boards. You can read the abstract of the upcoming Physical Review Letters paper for more information on lonsdaleite and wurtzite boron nitride.